BDS Suspension is now offering a full lineup of suspension lifts and accessories for the 2017 RAM 3500 4WD trucks. 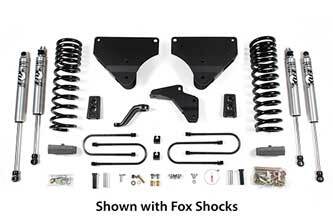 These kits carry over from the current 2013-2016 RAM 3500 lift kits and have been test fit and confirmed compatible with the new 2017 models. This lineup includes 2", 3" 4", 5.5-6" and 8" kits with clearance for up to 40" tires. BDS kits are designed to not only improve the appearance, ground clearance and offroad capability, but maintain on road comfort and drivability. As with all BDS products, these kits are backed by Factory Protection Plus for peace of mind wherever your adventures may take you. This includes BDS's no fine print warranty and a 5-year, 100,000-mile extended drivetrain warranty. Take your 2017 RAM 3500 to new heights with BDS Suspension. 2" Leveling Kit: These 2" leveling kit use a pair of heavy-duty fabricated steel coil spacers to level the stance and allow for up to 35" tires to be installed. The spacers are pitched and indexed to work with the unique coil mount design of the late model RAM HD trucks and are secured to the coil bucket to maintain proper indexing when the coil springs are unloaded. Extended polyurethane front bump stops are used to control suspension compression along with your choice of BDS NX² series or FOX 2.0 gas shocks at all four corners. 3" Radius Arm Lift Kit: The 3" radius arm system gives all the benefits of a high performance system at a lower height designed for 35" tires. 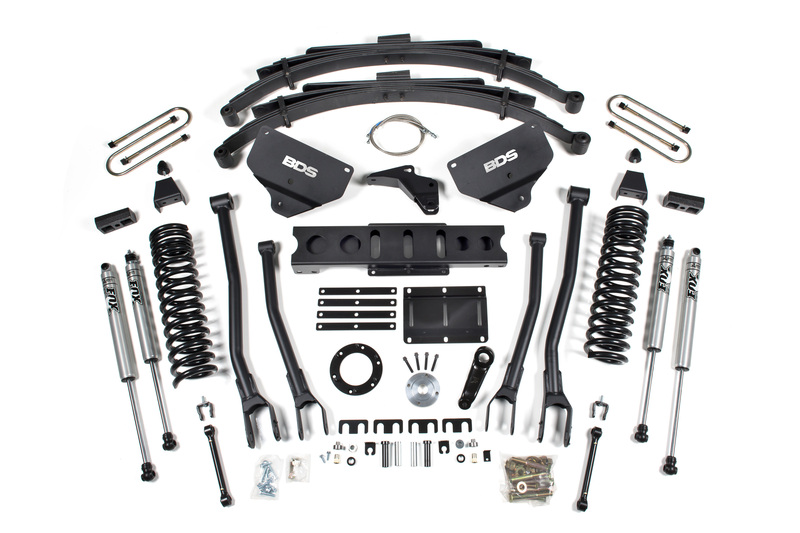 Along with progressive rate front coil springs, the kit includes heavy-duty high clearance tubular radius arms with large 3.5" bushings, a solid stock turnbuckle style adjustable track bar, front sway bar links, rear 2" blocks, longer u-bolts and your choice of shocks to allow fitment of 35" tires. 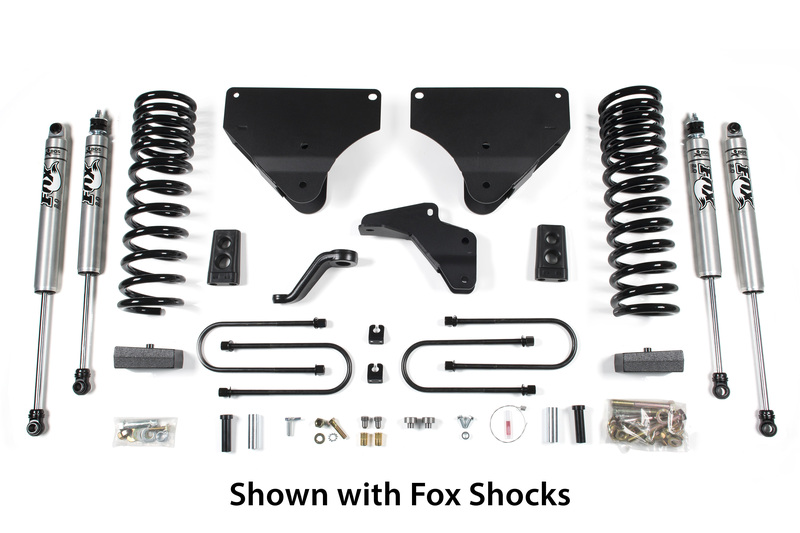 4-6" Standard Lift Kits: These standard kits are designed to retain the factory radius arms by relocating the frame mounting location using a pair of 1/4" steel drop brackets to maintain suspension geometry. The drop brackets key off the factory mounts and tie into the frame for extra strength. Also included in the kit are specially designed gas or diesel engine specific progressive rate ProRide front coil springs offering improved performance across all terrains. 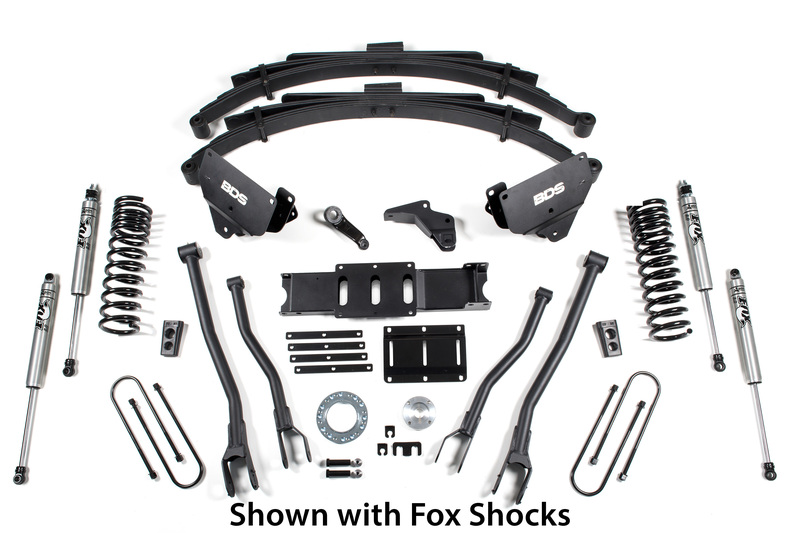 Also included is a heavy-duty fabricated front track bar bracket, forged drop pitman arm, extended bump stops, brake line relocation brackets, sway bar links, rear block and u-bolt kit along with your choice of BDS NX² series gas shocks or FOX 2.0 performance gas shocks at each corner. The 5.5-6" kits also include a high clearance transmission crossmember and transfer case indexing ring to allow the use of the stock driveshafts. These kits allow for up to 37" tires to be installed. 4-6" 4-Link Lift Kits: These kits are designed to convert the factory radius arm over to a stronger 4-link design offering improved stability, handling and articulation. The kit is designed with 1/4" fabricated 4-link brackets that key into the factory radius arm pockets for added strength. The 4-link design improves handling and drivability by limiting castor change to less than 1-degree throughout wheel travel. 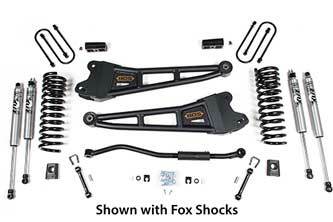 These kits also include gas or diesel engine specific progressive rate front ProRide coil springs, front and rear track bar brackets, a forged drop pitman arm, extended bump stops, brake line relocation brackets, sway bar correction, high clearance transmission crossmember and transfer case indexing ring (5.5-6" kits only), and either a rear block kit or GlideRide rear leaf springs (only available on the 5.5-6" kits). 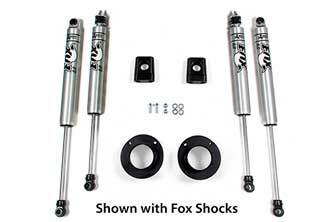 All kits are finished off with your choice of BDS NX² or FOX 2.0 gas shocks at all 4 corners. These kits allow for up to 37" tires to be installed. 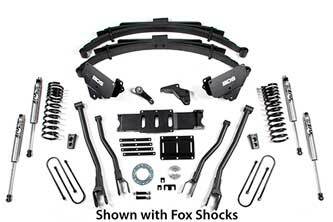 8" 4-Link Lift Kits: The 8" 4-link system has been engineered to offer premium on-road comfort and superior offroad capability for the best all-around performance out of your new 1-ton RAM trucks. 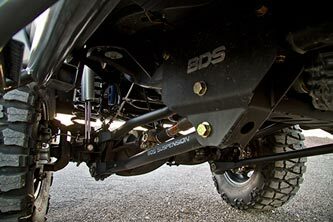 The system converts the factory radius arm suspension to BDS's tried and true 4-link design for improved stability, wheel travel, and handling across all terrains. The 4-link design limits caster change to less than 1-degree of change throughout wheel travel for better handling, steering control, and overall drivability. At the heart of the system are a pair of massive frame-mounted brackets precision welded and engineered to position the new upper and lower control arms for optimal suspension geometry for late model RAM trucks. The 4-link brackets are fabricated from 1/4" thick steel and wrap around the frame as well as the factory radius arm brackets to create an extremely sturdy mount for the new arms. The upper and lower control arms are built from 2" OD x 3/16" wall DOM tubing for the strength to take any abuse you can throw at them. They utilize large 2.5" OD polyurethane bushings to isolate road vibrations and are formed inward to allow for extra tire clearance. The additional height comes from a pair of specially designed dual rate ProRide coil springs. These 8" coils have been engineered and tested to improve the ride quality and performance across all terrains while holding up to the rigors that 3/4-ton truck owners demand without bowing or sagging over time. A heavy-duty track bar relocation bracket is supplied to recenter the front axle once lifted and a forged drop pitman arm is used to correct steering angles to keep them in place for proper handling. Also included in the kit are extended sway bar links, braided stainless steel brake lines, new bump stops, a low profile transmission crossmember and transfer case indexing kit to allow the use of the factory driveshafts. In the rear, these kits are offered with your choice of block and add-a-leaf kit or replacement GlideRide triple stage leaf springs. 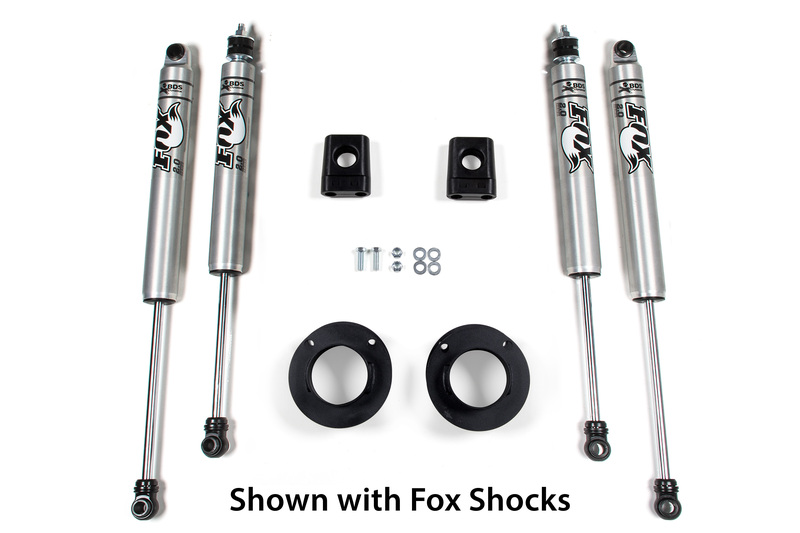 Longer u-bolts, brake line brackets and your choice of NX² series or Fox 2.0 performance gas shocks all the way around finish out the 8" 4-link systems. These kits allow for up to 40" tires to be installed. 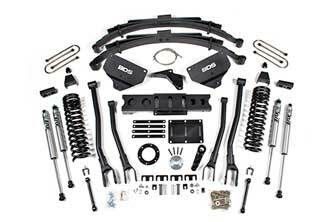 On the lift kit for 3500 ram dually, do you offer any with factory air leveling? Unfortunately we do not offer an lift options for the factory rear air ride equipped RAM 3500 trucks at this time. While we haven’t tested the cab/chassis model 2017 RAM 3500, assuming chassis/suspension the same as the standard RAM 3500 4WDs trucks we offer 2-8″ Lift Kits to fit them. Hey Benjamin, all of the late model RAM 3500 kits are compatible with SRW and DRW (dually) applications.